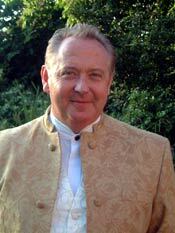 Martin McEvoy is a professional Opera Singer, Vocal Coach and Broadcaster. He has performed with New Sadlers Wells Opera, The Royal Opera Covent Garden, Opera North and Scottish Opera. He was a regular broadcaster on the BBC Radio 2 programme Friday Night is Music Night and Melodies for You. He is the Artistic Director of Crystal Clear Opera and London City Opera. In recognition of its high artistic standards CCO was awarded an Arts Council England grant to tour throughout the U.K. and LCO worked in collaboration with Columbia Artists, New York on five annual tours of the USA. Martin is now in demand as a singing teacher and coach. He is also an adviser on vocal technique and presentation skills at board level to many national companies. He has summarized his life time experiences in opera and touring in his one man show An Aria in Your Area! Great highlights of Martin’s career also include playing the front end of a horse, opening in a new West End show and closing in the same week, being cut from the final edit of two major feature films in the same year and having to escape the clutches of amorous theatre landladies on many occasions! !